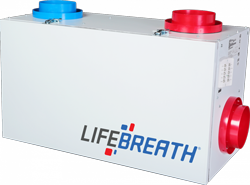 Lifebreath Residential HRVs are the best choice for ventilating homes or workplaces. These units are designed to provide fresh air into the building while exhausting an equal amount of stale air to the outside. 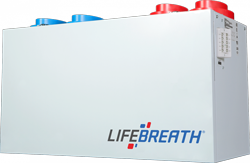 During the heating season, Lifebreath’s heat recovery ventilators (HRVs) replace stale air with fresh air throughout homes and businesses, helping prevent moisture build-up, toxic mold and rot. Most popular single core HRV featuring door port balancing and the high efficiency HEX core. Two centrifugal blowers driven by a common PSC motor with multiple fan speed operations. Latched door to allow easy access to core and filters for cleaning. 25″ clearance recommended. Top Ported . Controller with 5-speed, 4-mode operation, included. Door port balancing and 3 selectable high speed settings. Featureing our patented HEX Core. Top port design for flexible installations, with door port balancing and 3 selectable high speed settings. Featuring the high efficiency HEX core.